Description: Tight fairways with trees in play on every hole. Elevation used well throughout playing up and down. A good mix of short and long holes with a few uphill bombs. One river hole. Local Directions: FROM THE EAST: Take HWY 19 west into Waterloo and that turns into E. Madison St. Head north on Hendricks into the park. Follow road around baseball fields and park to the north of the two buildings. Follow split road to the west to the 1st tee in extreme SW corner of Park. 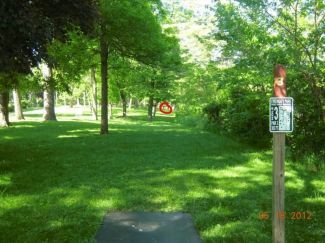 NOTE: Current location (see "Map Location") takes you to Hole 1. You can park on the street there (west side of Park Ave.).